Mel OLeary says Meredith-Springfield has earned a reputation as a go-to company for difficult projects using the blow-molding process. He was referring to work with Reebok in the early ’90s to develop something called the “dynamic mid-sole crossover,” or DMX cushion for short. This was the athletic shoe maker’s answer to Nike’s famous ‘pump,’ and for Ludlow-based Meredith-Springfield, it was much more than a $1 million, 18-month development project. 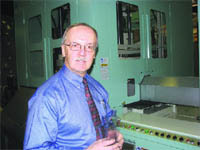 The Reebok project was in the early to mid-’90s, said O’Leary, founder of the business, but Meredith-Springfield has not only maintained that reputation for problem-solving, but enhanced it, with products ranging from the casing for a container in which bone marrow cells can be grown outside the body to fight cancer, to globes for a huge chandelier built for a casino in Macau, China. “The company intended to do it with glass globes, but that became cost-prohibitive, and the weight became prohibitive,” O’Leary said of the casino builders, adding that much-lighter-weight, fire-retardant plastic that looks like glass became the solution, and Meredith-Springfield the solution provider. This track record for handling tough assignments, coupled with great diversity in terms of the industries served by the company — everything from the household industrial chemical (HIC) market to the medical industry; from landscaping (vinyl fencing) to the personal-care realm — has enabled Meredith-Springfield to thrive even in the worst recession in 80 years. And it has enabled the company to make huge investments in new technology that will allow it to comply with clients’ demands for ‘greener,’ more environmentally safe plastic products. The company recently added a $1 million machine (and another is on order) that will enable it to manufacture products with polyethelene terephthalate (PET), an improved barrier-technology, or non-leaching, thermoplastic polymer resin now demanded by clients such as B & G Foods in Parsippany, N.J., for which Meredith-Springfield has been making containers for Vermont Maid Maple Syrup and other products for years now. O’Leary’s venture is also expanding physically. It recently acquired the property at 321 Moody St. (it had been leasing roughly 40,000 square feet of space there) and will eventually absorb the 50,000 square feet once leased by Bassett Boat for warehousing. For this special section highlighting the diversity of the region’s manufacturing sector, BusinessWest takes an indepth look at Meredith-Springfield, a company that is breaking the mold in more ways than one. As he talked about the bone-marrow-container project, O’Leary listed a number of elements that made this product quite complicated to manufacture. Michigan-based Aastrom Biosciences was (and is) the client, he said, and it wanted a container made out of special plastic that is very difficult to mold into a container of the desired size. “Gooey” was the word O’Leary used to describe this material, which represented just one of the challenging aspects to this project. How this low-profile company achieved such problem-solver status is an intriguing story, and one that O’Leary admits he hasn’t had too much practice telling. This will change now that the company looking to raise that profile. O’Leary has spent much more time and energy explaining the company’s name — which is where the story begins, sort of. It turns out that O’Leary and a partner in a medical-equipment-leasing business they started in 1979 as a side venture were looking for a name for their business. They chose their hometowns; O’Leary was from Springfield, and his partner, with apparently enough oomph to put his town first, was from Meredith, N.H. This business, a franchise, was eventually sold, with the partners going their separate ways. O’Leary would hold onto the corporate name Meredith-Springfield, thinking that someday he would again do something entrepreneurial. 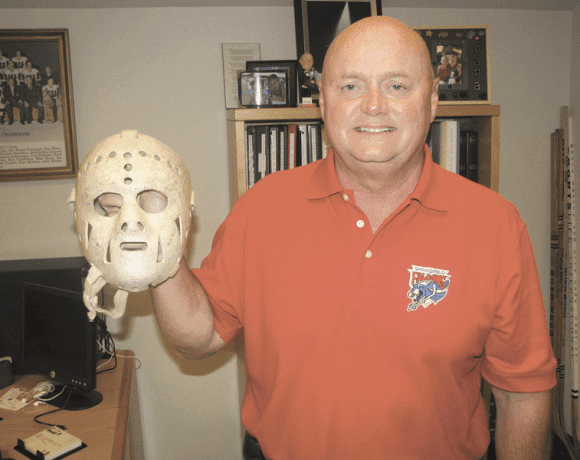 He did, when his career with Aim Packaging, a plastics company that operated out of the former Gilbarco complex in West Springfield, ended a few years later. O’Leary worked his way up the ranks at AIM, eventually becoming plant manager and, along the way, starting two new operations in other cities. But a trend toward self-manufacturing in many industries served by plastics companies eventually prompted serious consolidation at AIM, and O’Leary was fired in late 1982. With obvious hindsight, he calls this the best thing that ever happened to him. That’s because he took his background and started a plastics-consulting business, for lack of a better term. Elaborating, O’Leary said he, and eventually some other partners he brought in, also from AIM, provided support for the technical aspects of plastic-packaging development. Much of the early work was with the so-called ‘soapers,’ which made everything from cleaning products to shampoo to mouthwash. And when the economics of self-manufacturing changed and companies started outsourcing that work, it helped Meredith-Springfield make a successful conversion from a venture that started as a development company and did a little manufacturing to a manufacturing company that still does some development. Technically, the company is a plastic extrusion blow molder. This means that it uses blow molding, a process by which tiny plastic pellets are converted into a hot plastic hose, said O’Leary, adding that a two-part mold is closed around the hose, and air is blown in to create everything from bottles (to hold everything from soda to motor oil) to the freezer packs used in lunch boxes to the so-called vapor-recovery boot (part of a car’s gas-tank assembly). The company has moved from O’Leary’s home to a plant on Cottage Street in Springfield to the present facilities in Ludlow, growing steadily over the years to where it now boasts 50 employees. The turning point, as O’Leary said, was the Reebok project. Until that time, Meredith-Springfield was enjoying ample success as a blow-molding manufacturing and engineering company, making products for Johnson & Johnson, Kraft, PepsiCo, and other clients, most all of them bottles — eventually to contain everything from witch hazel to maple syrup to toilet-bowl cleaner. Reebok was looking for a molder to develop and manufacture the DMX. Meredith-Springfield handled the former, and, because it couldn’t find a molder to take on the assignment on a production basis, it assumed that role as well until one could be found (overseas) to handle the volume. There have been other success stories along the way, ranging from the plastic fencing that has become a big part of the business (yet also the only one to see declining sales due to the collapse of the housing market) to the curved neck on toilet-bowl-cleaner bottles, for which Meredith-Springfield attained several patents. “Part of the art and science of our work is marrying up the right plastic with the right application,” O’Leary said, adding that the biggest development for the company has been its hard-earned reputation as a problem-solver, won through work on the casino chandelier, the bone-marrow container, and even large, plastic advertising tools called factices, developed for Elizabeth Arden to showcase a new product. Recently, Meredith-Springfield has had to solve a problem of its own, if it can be called that, in the recent shift toward use of PET in the production of many items used for the food industry. B&G Foods is one of the clients pushing for the change, said O’Leary, noting that the plastic long used in the making of bottles for products like Vermont Maid has fallen out of favor with large chains like Wal-Mart and Kmart. The new, preferred product is something called stretch-blow PET, or simply soda-bottle resin, as it’s known in the industry. Making the transition needed to keep B&G’s business has required a massive investment — again, in the middle of a recession, said O’Leary, adding quickly that the company is looking at this development more as an opportunity than a challenge, an investment more than an expense. Indeed, machines that had been devoted to Vermont Maid and similar products can now be put toward different business requiring extrusion methods — and there is plenty of it, O’Leary added — while the company has set out to be a leader in stretch-blow PET. When asked if his primary competitors were domestic or foreign, O’Leary paused for a minute to measure and prepare his response. This reputation for being able to think outside the box, to take the whimsical — like the glass-like globes for the chandelier in China — and make it reality, has enabled Meredith-Springfield to not only make the mold, but break the mold and move well beyond the plastic bottle.